Beer Towers are all the rage now. Whether you own a pub or a nightclub, these novel drinking towers have a list of reasons why you should consider bringing them into your establishment. Beer Towers aren’t just cool, they also increase profits. Here are just a couple of the reasons why you should be offering beer tubes in your establishment. They are a novelty item so they get other customers talking. It frees up the bartender and servers’ time to serve more customers. Customers like it because they get to play bartender. Since there’s no waiting to be served, customers end up drinking more than they normally would have. Although they’re commonly called beer tubes, draft beer towers and draught beer towers, they’re also referred to as booze tubes – meaning that you can offer any of your most popular cocktails in these bad boys. 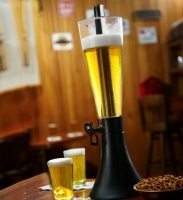 Below, we’ve listed an assortment of beer towers that we offer through our bar store. Simply click on the link in the description of the image of any of the beer tubes to go directly to our bar store and learn more. If you’ve seen a beer tower in a restaurant or club, it’s likely been this one. This popular style is 34 inches high with an 8 inch base. It holds 3 litres of any beverage, alcoholic or non, and has a dual dispensing method – by pull down handle or from push button spout. If you’re wondering what could be better than a booze tube, the answer is a chilled booze tube with an added light show! A small switch on the bottom of this tower sets off a light show as multiple fluorescent lights illuminate the liquid making you feel like you’re at the club. The tube itself holds 3 litres and in addition to the light show, boasts an ice tube that keeps the beer (or any liquid) cold throughout the time it’s on the customers’ table. The tower has the same dimensions as the regular beer tower above except that it has a differently designed base. Sometimes 34 inches is just too tall of a tower for your bar or restaurant. Or, maybe you’d like to include other alcoholic beverages like margaritas or martinis rather than beer. If that’s the case, you’ll love this 23 inch clear plastic booze tube that holds 3 litres and has a larger base, making it easier for servers to carry. The serving system is the same insofar as it’s a pull down tap like the others. And, just to ensure that your customers always have chilled beverages, it comes with a chilled tube insert. At 2.5 litres (83 ounces), this ice tube tower is perfect for any beverage – beer or otherwise. For those tables of 2 or 3 who don’t want a full 3 litres, this is a great option. The colourful base stands out amongst the crowd, gets noticed and gets people talking. This little baby stands 25 inches high and has a 9 inch base. At 32 inches high with a 7 inch base, this clear plastic tower comes with an ice tube to ensure its contents are kept chilled at all times. Best of all, the tube is removable, detaching easily for cleaning and re-filling. Most beer towers don’t come with an area for your patron’s cups, but this one does. With the ability to hold 3 litres and a base designed to hold a cup, this is a popular choice amongst bar and pub owners. This is truly the king of beverage dispensing towers. Holding 96 ounces of the beverage of your choice, complete with a super chill rod – meaning you won’t have to fill the tube with ice – and a swivel design. What that means to customers is that anyone at the table can be the bartender. The swivel base spins around so that the tap can face any direction. Oh, and the tap isn’t your average pull down to dispense type. Oh no, this one comes equipped with a push your glass against the tap to deliver the boozy goodness kind of tap. Only quality here. Because of the classy elegance of this booze tube, its perfect for any nightclub or event. If you’re looking for elegance in a draft tower, than look no further. This draft beer tower looks like a large Stella Artois glass. It comes with a solid 6.25 inch metal base, holds 3 litres of your favourite beverage and stands 20 inches high. And with a removable ice tube that gets filled with ice you can rest assured that your customers drinks will stay cold. If you’re looking for something with a little class that isn’t going to break the bank, this is an excellent choice.